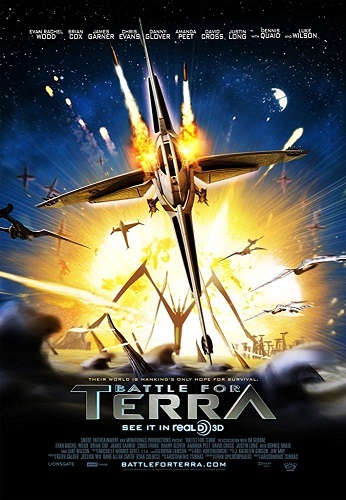 A CGI movie that I saw on Television in the early 2010s/late 2000s. A armada of human spaceships reach a planet that the human government think the humans could colonize and live on, due to the state of disrepair that their space station is in. A reconnaissance force is sent down to the ground of the planet where they find a peaceful squid-like alien race. At some point one of the pilots goes down and he is helped by one of the female aliens. The pilot manages to get back to the human space station where there has been a coup d'état. The dictating general of the humans now says that he plans to kill all the aliens and colonize the planet as he thinks that the space station will not cope with another voyage through the galaxy to try and find another planet to settle on. Meanwhile, the female alien that helped the pilot speaks with the chief alien and finds out that the alien government have their own military force consisting of star fighters that resemble flying bongo submarines (from Star Wars.) Alien technicians, with the help of the female alien previously mentioned, access human history from a human robot about why they were searching for a new planet to settle on - humans lived on Earth and colonized both Mars and the Moon. At some stage the planets went to war and destroyed each other, the remaining humans from these planets came together, created a fleet of star ships (and the space station that is seen) and begin searching other systems for a habitable planet, failing until they reached the aliens' planet. The humans begin an invasion of the planet (using space fighters that , from what I remember, resemble B-wings from Star Wars.) but are surprised by the alien fighters that attack them when they enter the atmosphere. At some point the humans put down a "oxygen dispensing" ship that resembles a giant house spider and dispenses oxygen into the atmosphere. As the aliens are loosing and sufforcating, the pilot that was captured by the aliens decides to fly into the oxygen-dispencing spider ship, killing himself and the general onboard (the dictator.) The humans retreat back to their space station, defeated. At a later time, the aliens are seen to be living beside the humans on the planet, the humans living inside huge domes. Any help on what movie this is? When strange objects appear in the sky above the peaceful world of Terra, some of the inhabitants believe the gods have come to visit. Instead, human invaders swoop down and kidnap a number of Terrareans, including Mala's (Evan Rachel Wood) father. Mala saves a downed pilot, Jim Stanton (Luke Wilson), hoping he'll help her find her father. While certain Earthlings plot to take control of Terra, Mala and Stanton realize that the fates of both their peoples hinge on the choices they make. Not the answer you're looking for? Browse other questions tagged story-identification movie space space-colonization or ask your own question.